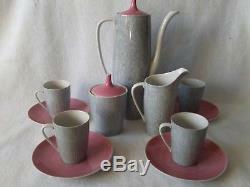 Fabulous vintage Cmielow china coffee set. Made in Poland circa 1950/60. 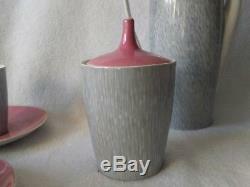 Styled in two tone complimentary grey and pink. 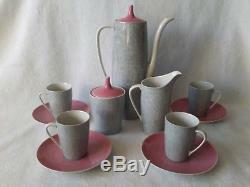 Superb slender elongated shape to the coffee pot. 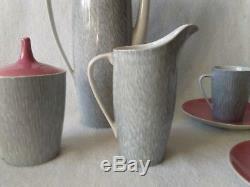 Creamer and lidded sugar bowl. 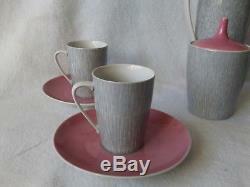 Set of four cups and saucers. In overall lovely condition with a few wee nibbles to the inside lids and cups. 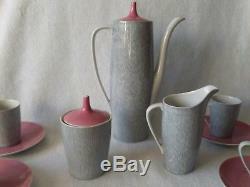 Coffee pot 9 1/4 tall. Creamer 5 1/2 spout to base. 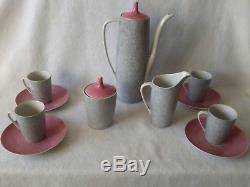 The item "CMIELOW Vintage Retro Pink & Grey Coffee Set Approx 50s/60s Poland" is in sale since Monday, September 17, 2018. 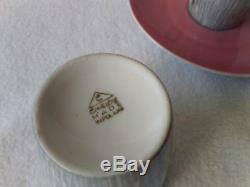 This item is in the category "Pottery, Porcelain & Glass\Porcelain/China\Continental". The seller is "oogle" and is located in Bridgend. This item can be shipped to United Kingdom.